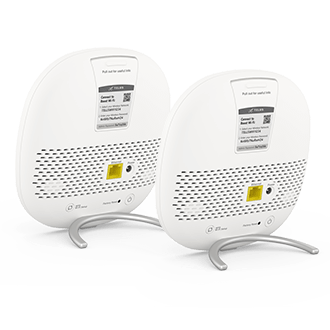 Say goodbye to Wi-Fi dead zones. Connect your entire home to the same network. Access Wi-Fi from every corner of the house, on any device with TELUS Boost Wi-Fi. The TELUS Boost Wi-Fi starter pack can provide up to 2,000 square feet of Wi-Fi coverage. If that’s not enough, we’ve got you covered with TELUS Boost Wi-Fi Expansion Packs. TELUS Boost Wi-Fi is more than just a Wi-Fi range extender. It automatically connects your devices to the strongest signal possible, so you’ll always get the best Wi-Fi. 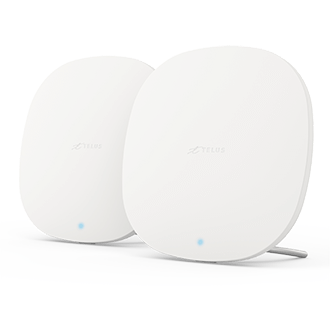 Learn how you can easily create a home mesh Wi-Fi network with TELUS Boost Wi-Fi. Already have a TELUS Boost Wi-Fi Starter Pack? Extend your coverage even further with the TELUS Boost Wi-Fi expansion pack.